*Regular nightly rate is $159. Weekly rate is stay for 7, pay for 6. Your reservation total will include a cleaning fee and bed tax in addition to the rental rate. The Coziest Contemporary Cabin with Fairy Ring in the Heart of Majestic Redwood Forest, Hot Tub and Outdoor Dining on Deck with Redwood Views in Every Direction. 2 TV's, Central Heat, Gas Fireplace. Wi-Fi, Unlimited Domestic Long Distance. Keyless Entry. Walk to Creek. Short Drive/Cycle to Caz General Store, Raymond's Bakery, Duncans Mills, River Beaches, Coast, Wine Tasting, Golf, Hiking. Your Well-Behaved Dog is Welcome! Up a set of steps, the living room is open to the kitchen, with a dining set and bar seating, and opens to a deck, outdoor dining, and hot tub. The bedroom and bathroom are off the living area. 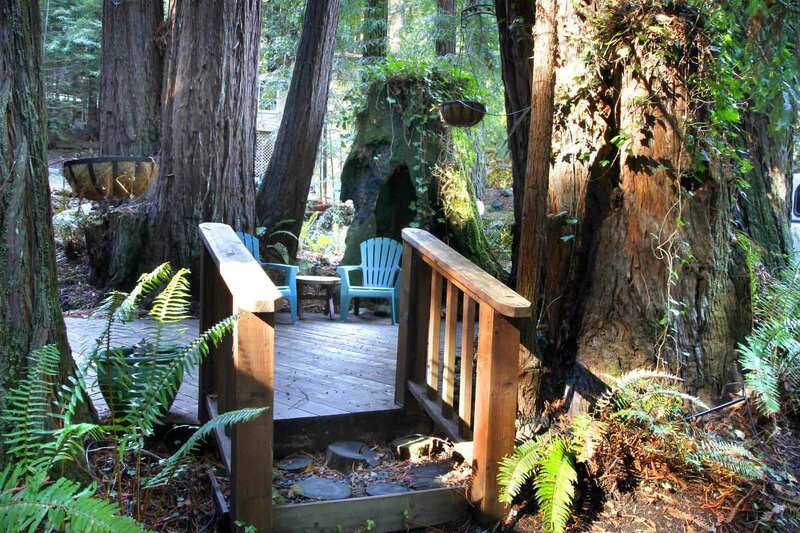 Outside the front door, a separate side deck is built inside a redwood fairy ring. There's a seasonal creek on the property, and you can walk to Austin Creek's gravel beaches and swimming holes. Central Heat, Gas Fireplace (living room). NO A/C. Most Excellent Area for Cycling! "We absolutely loved this place"
We absolutely loved this place and location. Even though it rained the whole time, it sounded amazing along with the stream behind the house. Thank you so much for such a cozy place to relax and read. I will be recommending it to my friends. "We really enjoyed our stay!" This place is great! The kitchen is great! The hot tub is awesome! We really enjoyed our stay! 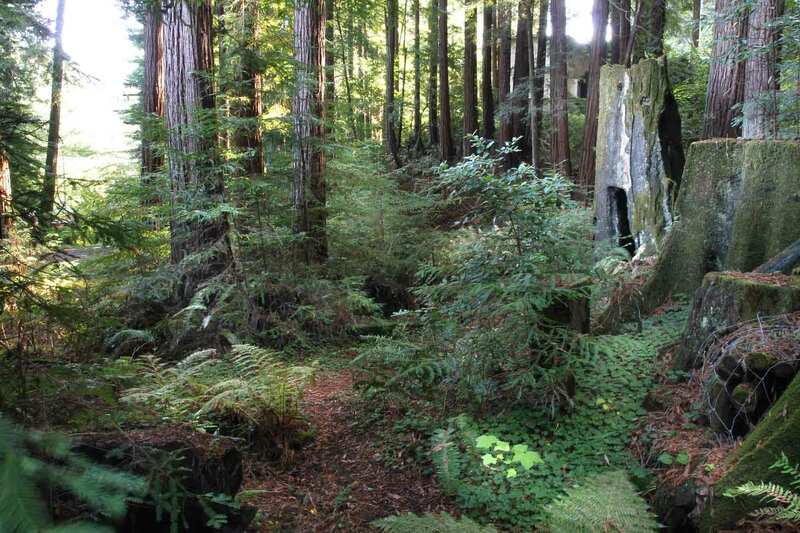 "a nice and peaceful place for a retreat"
Located in the middle of the redwood forest, this is a nice and peaceful place for a retreat. The two best things about this house are the giant kitchen and the hot tub. What was disappointing was that the listing indicated that there was a queen pullout sofa in the living room, but the mattress on that pullout sofa was horrendous. If you lay down, all you could feel is the metal coils hitting your back, so we did not end up using the mattress. The house is quite pretty, with an instagrammable kitchen and a window that peered right into the redwoods. The gas fireplace is a great touch, heating the living room to the perfect temp for the winter. There is no AC, so be wary if you are coming for the summer. There was not a TV in the living room., but there was a TV in the bedroom. Note that the bedroom doesn't have heat like the living room, so you'll have to get more blankets from the closet. 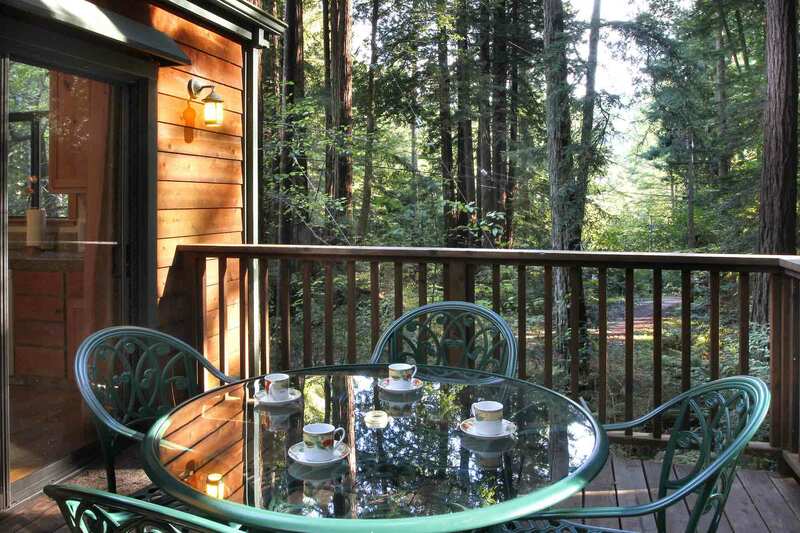 Outside on the deck, there is a table for four, perfect for enjoying coffee under the redwoods. In addition, there is an amazing hot tub that is already heated. 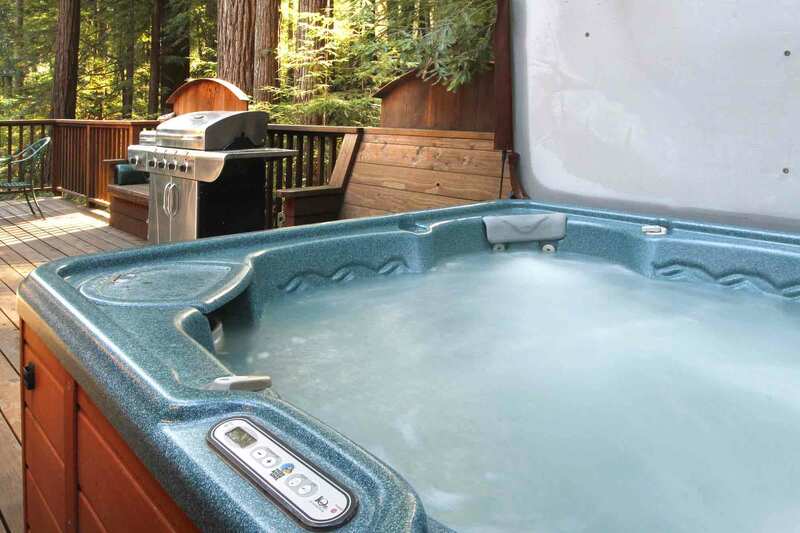 If you could bare to pull yourself away from the hot tub, the beach and the Russian River is only 10-15 minutes away. "nice facility in a great area"
It was a nice facility in a great area. The place was extremely clean. The hot tub was a plus! The kitchen was put to use and all the necessary amenities were present. The owners put a great book together with local places to visit and instructions on heating/cooling/fireplace, etc. The only draw back was the sofa bed didn't have bedding and the code to get in and out of the house was no longer valid at 9:30 am even though our check out was 11 am. We were almost locked out of the house with our belongings inside. Luckily one of us was inside. We were very careful not to close the door when taking stuff to the car at that point. Otherwise we enjoyed our stay and would stay again!
" Good deal for a Couple"
The Property is quiet, peaceful and well hidden. Good deal for a Couple, limited parking for only one vehicle. This is a single couple retreat. There is no room to run the Pooch if you have one. "Great location off the beaten path "
We enjoyed our time at this home in the woods. The location is very peaceful and quiet. The kitchen was well-appointed and we had everything we needed. Bed was comfy and the hot tub on the deck was private and enjoyable. Great location off the beaten path but a short drive from the coast and wineries. Beautiful home, very quiet and peaceful! Highly recommend this super clean and private home. Best part was the hot tub under the redwoods that was already heated when we arrived! Kitchen is amazing although we didn't cook much, super homey with a wonderful feel. Can't wait to return!! "Hidden gem in the redwoods." Hidden gem in the redwoods. Only 15 minutes to Guerneville or Jenner. Cozy and comfortable. Beautiful setting. Thoroughly enjoyed our stay. Dog friendly. Clean and well appointed.
" easy to forget about the rest of the world"
Great space and great location - easy to forget about the rest of the world here, yet get back to it quickly if you need to. The neighbors are closer than the pictures make it seem, but there was still an amazing sense of privacy and calm. The space was perfect for a weekend away. It was quiet, comfortable, and an easy drive to the river and the ocean. We loved the hot tub and appreciate that the space is dog friendly! Would definitely stay there again! It's a beautiful property. House was immaculate. The hot tub under the canopy is great!
" they were very kind and understanding"
" better than I expected"
Amazing house, better than I expected, very clean, would highly recommend it! What a gem! Super clean, cozy, well-appointed. Very private, amazing location, the quietness of the woods is intoxicating. Just miles from the coast, locals were very friendly. So many great things to do nearby. It was everything we wanted and more. We will definitely be back. "a nice place nestled in the redwoods"
This is a nice place nestled in the redwoods, a 15 minute drive from both Guerneville and the beach. 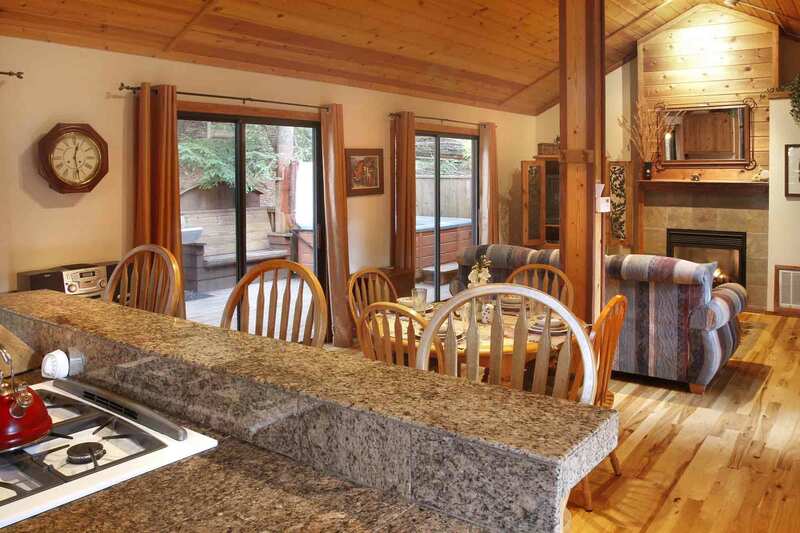 Lots of space, nice fireplace, it's great to relax in the hot tub under the giant trees! We really enjoyed our stay here at the cabin in the woods. No ac was needed as temps were cool even when it was in the upper 90s in the valley. The back deck and gas grill were the best features. The house had plenty of room for the 2 of us and the bed was comfortable. Bathroom was good and shower worked well. Kitchen was in good order and everything worked well. Cooking spices and condiments were lacking, so we needed to go buy those. Internet was fast and reliable; cable tv available. This place is pet friendly, so keep that in mind of you have any allergies. Sitting on the couch triggered allergies in both of us, so we covered it with a sheet and that helped. The couch is not too comfy for sitting, and the recliner, although comfy, doesn't work very well. The tv's have been upgraded to flatscreens which was good. We felt the neighborhood was safe and nearby neighbors were friendly. It was very close to the coast and so it is a bit of a drive to get to the 101 in the valley. There are restaurants and grocery stores within 15 minutes. For a mid-summer get away this place was great for us. I'm not really sure what happened with this property.. I've stayed at different properties with this company and have never had one negative thing to say.. However, this property was not the same.. I have been in contact with the company about the main issue (power) and have worked it out and I have been compensated for a nights stay in the future (this was my choice, I was offered a refund but chose to apply it to a future stay). Other than the power issues, there were several more. The place really is beautiful, but definitely lacking. The furniture in the living room area was extremely uncomfortable. The couch was old and caved in and the recliner chair was not functioning properly. The washer and dryer made all of my laundry smell like mildew after being washed. I didn't even want to put them back in my suitcase so I put them in a garbage bag instead to take them home.. No complaints about the bedroom; it was nice and dark with the blinds drawn in the bright morning sun. Perfect for sleeping in.. Although, that is not what happened. Construction on a property going up next door started promptly at 7:00 am, complete with concrete trucks and jackhammer. I figured, since I'm up I'll visit the hot tub.. Not so. When construction is going on, there is no privacy as trucks are parked up the street behind the property as well as leading up to it. This is clearly not the fault of the rental company, but still makes this particular stay, when combined with the actual property issues, the exact opposite of a peaceful, private, relaxing getaway.. (which is what I really needed, maybe next time). I will continue to book through Russian River Getaways as they really do have some great properties, but will probably not book this particular property again. "This is a great place to stay..."
This is a great place to stay if you want to relax and explore the area. It's very quiet and peaceful, and having a hot tub is amazing. Lots of great hiking and places to eat nearby. I wish I could have stayed for a few more days. We has a great time. Nice and private. "We absolutely LOVED our stay..."
We absolutely LOVED our stay, and have recommended it to a few friends! Perfect for a couple's getaway. Thank you for everything! Had a lovely time up here. The house was ready for our arrival and so welcoming. A nice and quiet retreat with a lovely amenities and good feels. Thank you! Great place. Quiet and peaceful. Love the road up to the cabin. Quiet place in the woods. No cell service (you've been warned). Super quiet little spot in the woods. Great for a short getaway for 2 of us and our dog. Loved the hot tub and huge gas grill. Location is quiet and beautiful, fireplace is really nice and helps warm up the house. We recommend this space for a weekend away. This little place was warm and cozy! The privacy, views & amenities were perfect. Loved the hot tub. Grill worked great! Enjoyed the fireplace and deck w/views. We felt safe and sound and the location was wonderful. We hope to return again soon to this little hidden gem! 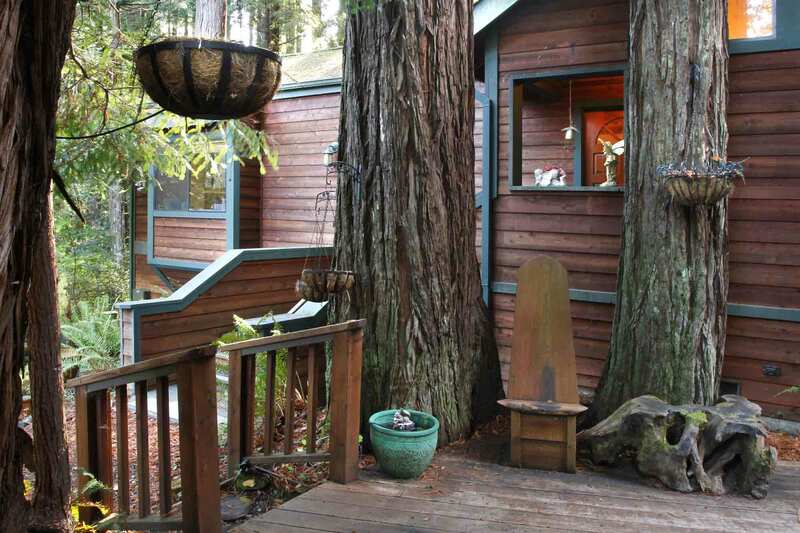 Only a minutes drive to Duncan Mills coffee, pastries, and shops allowed for hot tub mornings under the fog filled redwoods, starry nights on the deck, movies in bed, and reading by the fireplace. Note, bring your own dvds. No cell service. Has WiFi. This place is great!! Really beautiful location right in the redwoods. Clean, well stocked, comfy bed! Loved the hot tub, deck, gas fireplace, and open kitchen. And, it's only 15 minutes from Goat Rock beach...I took my dog there every day of my stay. The only 2 little things that would be helpful to change is the couch in the main room (pretty uncomfortable to sit on because the bar to the hide away bed sticks out a bit). The other is the shower, I couldn't get more than a drizzle out of it, so it took awhile to take a shower. Other than these two little things, this was a wonderful hideaway!! The hot tub has two redwoods literally pressed up against it, so it's pretty amazing to sit in there underneath them. Make sure to look through the photo book of the renovation. Great stay!! Thank you for the feedback and the review Alicia! We're glad you enjoyed your stay, and we'll check out the couch and shower. Hope you'll be back soon! The cabin was very nice, especially the deck and the hot tub that are nestled in the amazing trees. We really liked the open space with the kitchen, eating area, and living room. The three sliding glass doors allow you to feel like you are outside even when you aren't. The coffee carafe and the toaster were broken so we called the management and they immediately went out, bought new ones and delivered them to us. We were very impressed. My only recommendation is that the sofa and recliner get replaced. They are old and uncomfortable. Otherwise, a great place to get away from it all. "Clean, romantic, quiet get away"
This was our second stay at Euphoria. We went up on the Fourth of July to get away from the noise of the city. Unfortunately, the neighbors were doing construction on their home our entire visit. I know that the rental agency has no control over neighboring properties, but it ruined our vacation. All we wanted was peace and quiet, and we got hammering, drilling, and sawing from sunrise to dusk. There are some fixes that need to be made at this cabin. The bathroom sink handle kept coming off. It looks like a large bird flew into the bathroom window.....and left something unsavory behind. 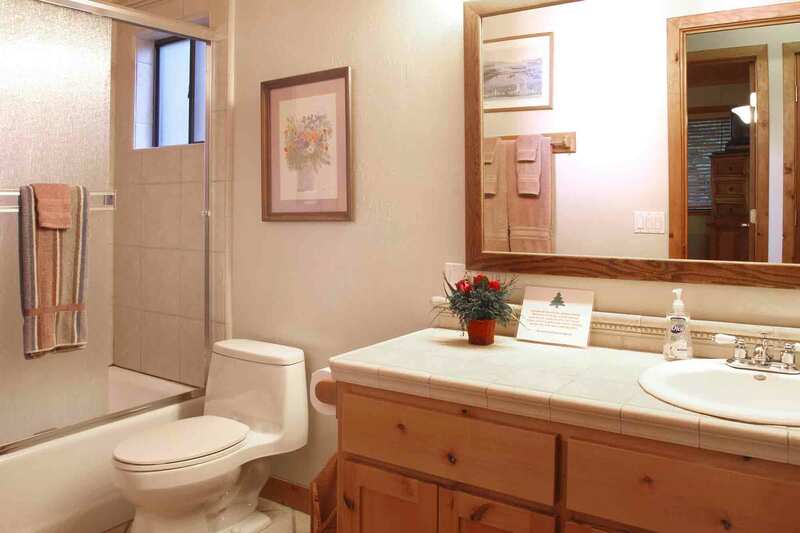 If you want privacy, steer clear of this rental. You can been seen from many other houses when you are on the deck or using the hot tub. 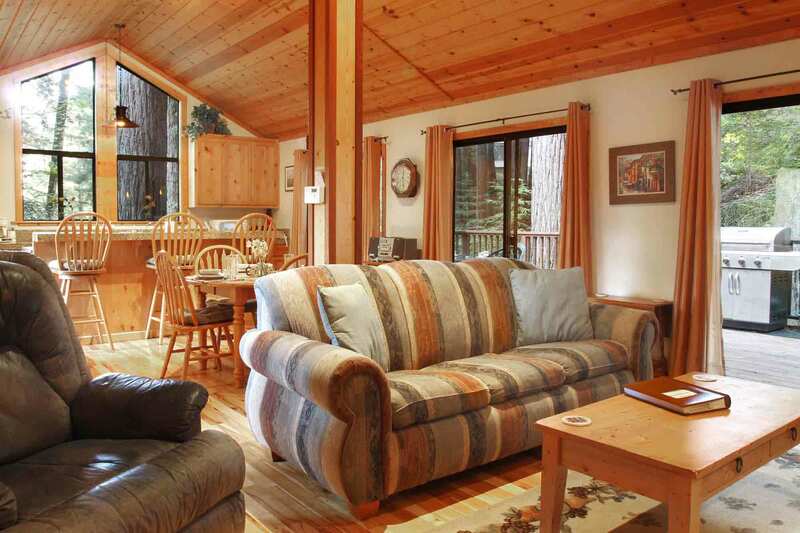 The layout of the cabin is nice and open, beautiful neighborhood, close to shops. This trip just fell short for us this time. This was my second visit to this lovely cabin in the woods and I loved it again. It is very quiet and peaceful out in the redwoods. The house is comfortable with a great kitchen and grill. The only down side was the living room furnishings could use some updating. When my family came and we needed more than one bed it was not super comfy in the living room. This would not prevent me from staying again. They are very dog friendly and I loved being able to bring my pup with me! Very nice home. We ended up leaving a day early due to the uncomfortable king mattress. The couch was also quite uncomfortable for us to sit in. You have a beautiful home and location, but these small improvements would be very nice. Beautiful surroundings. Hot tub and fireplace big pluses. Kitchen well equipped. Couch and a few furnishings are showing their age. "Peaceful, come rain or shine!" We really enjoyed our stay here. The brook on the property was flowing nicely. We got quite a bit of April rain, but then some days were clear and bright. The bed was comfy, the kitchen was adequate for our needs. The one issue we had was the tremendously low water pressure. I'm not sure if this home is on well water or not, but it took 30 minutes for me to fill the bathtub. My husband opted for a shower which was an incredibly weak stream and took some creative water capturing techniques to come clean! The person who rented before us or the cleaners, left a wet towel in the dryer and it stank to high heaven. I tried rewashing it but the smell was so bad, it wouldn't come clean and it reeked the dryer so we could not use it. Not the fault of the homeowner by any means. Just an unfortunate mishap. The owner was very responsive when the wifi didn't work. Comcast came out and found that the people staying there before us had plugged the cable from one port to another port in the same unit which was causing the wifi problems! Probably the same people who left the wet towel in the dryer! One other thing: owner should upgrade the DVD player to a BluRay - we brought our Netflix movie but couldn't watch it because it wouldn't accept BluRay. Anyway, nice location, quiet, great for the old dog, beautiful location, clean air, and the wifi does work. Bottom line; we'd rent this one again! Beautiful, quiet spot. Everything I wanted and as advertised. Would recommend! Took several nights off to go up to the Russian River area on a bike/hike training retreat- Euphoria couldn't have been more perfect. I left for all my bike rides from the house and covered miles that me down the coast, through the forest, along the river, through small towns and pastures, and through wine country. The location was quiet and peaceful, the house had everything I needed, and I had an incredible time. Thanks for a wonderful stay- I'll definitely be back! "Awesome but needs some TLC"
I'd stay here again in a heartbeat. BUT it is in need of a major deep cleaning. Also out of the 3 patio doors- only 1 had a handle on it. And lightbulbs were either burnt out or very low wattage so it was super dim, especially being in the woods. We stayed for 5 nights so used the kitchen a lot and it was difficult to see what we were cooking. Hot tub needed a clean, too. BUT I still loved it and would go back. Also bad internet, but being in the deep woods this is totally understandable and I was on vacation so who needs a good signal? Overall I'd recommend it, just needs some updates and TLC. The area is beautiful and amazing! Very steep winding driveway so be sure to find it before dark! Go for it and stay here! Perfect little cabin if you want some solitude in the redwoods. Cabin is tucked away in a lush redwood forest, which is just beautiful at dawn and dusk and dead quiet for sleeping at night. 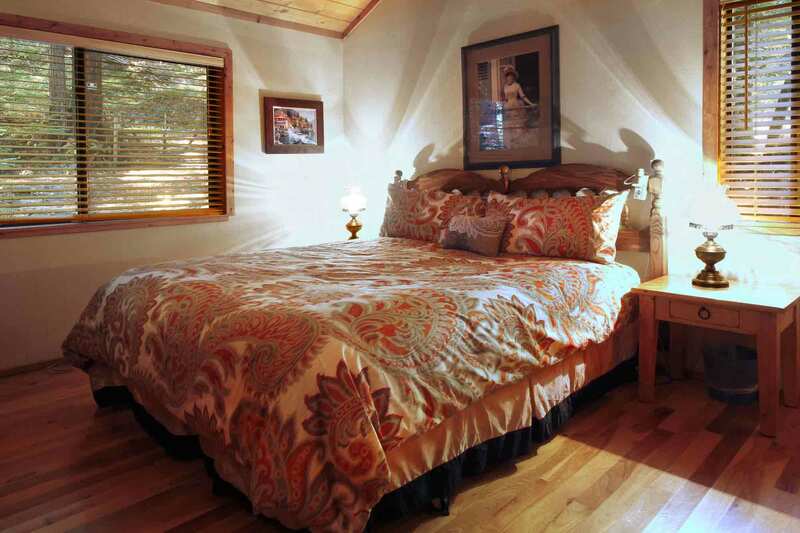 The cabin is charmingly rustic and cozy with _just_ enough amenities. The kitchen was well enough equipped that we cooked dinner each evening-- even succeeding with some last minute provisions from the Cazadero General Store. And between the hot tub, gas fireplace and cable TV/wifi, we were able to relax and unwind after some long work weeks as of late. The bed was comfy and there were plenty of towels. Very nice company, nice house. Unfortunately, BAD HOUSEKEEPING!. Too bad I cannot post pics. Dirty floors, dirty baseboards, bathroom counter had dried toothpaste, a ball of hair the size of my fist in the shower window, dirty kleenex and dust under the bed, tattered towels, crayons and food in an old dirty couch, dirty dishes! Very old electronics. 3 spoons. We called and they sent a housecleaner the next day. Very apologetic. when we returned, someone had folded the towels and the ball of hair was still there. Still yuck under the bed, dirty old rug and no runners, someone had turned the sheets inside out and made the bed. It made me wonder if anything we were using there was actually clean. Very bad. They just could not make it right. They refunded $95.00, they could have done better. "An absolute charm and place of bliss"
An absolute charm and place of bliss. Everything you need to make your stay comfortable and relaxing is there. The location is ideal for relaxation and peace. Hubby and I needed a weekend away, this was perfect. To start the drive was easy. A warm cozy cabin, easy drive to town, Jenner, and Bodega Bay - each had some very yummy restaurants with great service and we also found some really cute shops. We happened to arrive on a weekend of a big storm so curtains open by the fire watching the storm hit the giant Redwoods was pretty exciting and beautiful. A drive up the coast during the calmer times gave us a great view of massive waves like we have never seen. All around great location and cozy comfy!!!! "Euphoria" is aptly named and at the risk of making future reservations for ourselves difficult due to popularity, this home was heaven! Keyless entry that can be customized so you remember the combo, quiet/off the road location, houses nearby, but barely saw anyone the whole week! We BBQ'd and enjoyed the hot tub the very first night, everything clean and cozy too with the gas fireplace. The one bedroom, sofa sleeper and air mattress provided was more than sufficient for our family of four. The pictures are very accurate, and the owners provided a "before and after" photo album of the birth of Euphoria which we enjoyed very much. Lots of things to see and do in the area and all within less than 1 hour drive from the house. There were just a couple of minor items we reported upon our arrival which the office took care of promptly. Great service, great experience and we'll definitely be staying again in the future! My husband and I stayed for 4 nights. We couldn't have been happier. The house was even nicer than the photos. Beautiful hot tub on the deck and total privacy. 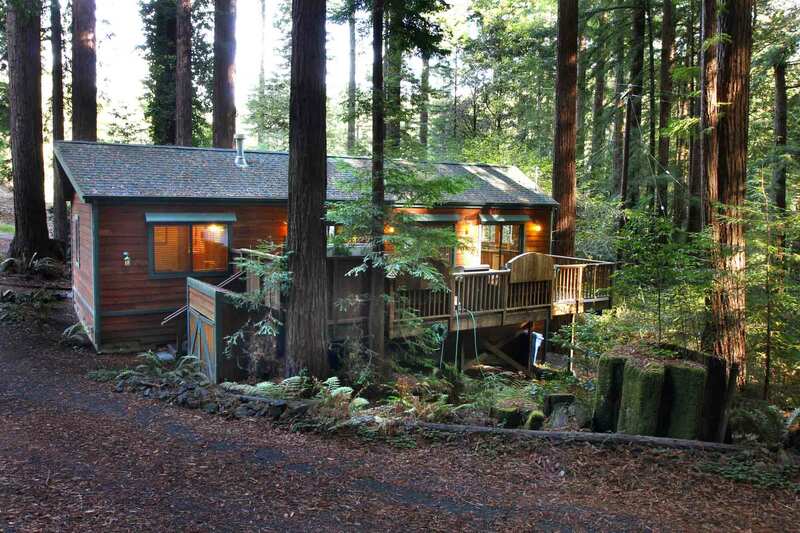 "Awesome stay in Northern California Redwood country"
The cabin itself was adorable and overall very clean. Easy driving distance to river beaches and ocean. And it was quiet and private. But the towels were old and rough and had a very funky mildew smell that we could not get rid of. There was a blood stain on the mattress protector on the fold out couch. The couch was dirty and either needs a thorough professional cleaning or replacement. The fold out mattress was impossible too sleep upon. It is completely flat and you can feel every spring. Ouch! Also, all the floor mats were crusted and stained with wear. The dishwasher handle was broken, so we couldn't open it to use it. The power went out (a pg&amp;e issue), and all the batteries were dead for the flashlights, and all the candles were totally burnt down. Luckily the gas fireplace worked. The laundry washing machine stank badly of mildew, so every time the door opened, the smell radiated into the bathroom and bedroom areas. We bought air freshner to spray and ended up using the towels we brought from home , which were meant for beach use. The rental management company has been informed of all these issues, so hopefully they will get resolved. The cabin itself was great, but the "incidentals" need some work. I would recommend the unit ONLY if the aforementioned issues were resolved. We chose the Euphoria because we had been there last year. We did notice that we were the first people that rented this year and things got overlooked. The place wasn't as clean as before, the slats on the blinds are falling off, there was no cleaner for the counter, so we had to go buy some. It states to wash towels and when you leave, please leave dryer open. Well when we went to wash towels, the dryer was closed, I opened it and there was a sponge and washcloths in dryer, they were still damp and smelled like mildew. Needless to say I washed those too. All in all the place was very nice but if things like this continue, people will be less likely to book here. We did leave a written review, hopefully things will be taken care of. The perfect little getaway! My boyfriend and I came here with our Labrador and could not have had a better time. Everything you need in a home, including a private hot tub. We will definitely be back! We loved this place :-) When we first drove up and saw the state of the property across the street we were concerned there might be construction noise or something similar but we should not have worried...it was peaceful and relaxing and the hot tub was divine and fairly private! Only small negatives were the fact that we could not figure out if there was exhaust for the stovetop/oven (didn't see an icon on the stove front for it) but this did not stop us from cooking anything, bacon included and that the water pressure for the shower was also a bit low but did the job LOL Thanks yet again for another splendid RRG hideaway - we will definitely come back to this one again sometime in the future! We spent three nights in the rental and enjoyed each one of them. The atmosphere was great and having the full kitchen made it even better. It was just like being at home. We thoroughly enjoyed the hot tub. We recommend this rental. Also a thank you to Russian River Getaways providing what was advertised. "Lovely, but with some issues." My husband and I, in addition to my parents, and dog rented the Euphoria for a wine country weekend. For the most part it was lovely- spacious, secluded, and quiet. And chilly! There is major tree coverage at this property, so not much sun broke through. We particularly liked the open air kitchen, hot tub, and gas fireplace, and this property is right up the road from a lovely bakery called Raymond's that does an awesome pizza/beer/music thing on Friday nights.On the flip, we were a bit irked about a few things that hadn't been tended to at the property. The gas grill on the deck was out of propane. This of course was realized after we'd purchased all kinds of things to grill for the evening, which ended up being cooked indoors. Additionally, there was no dishwasher detergent so we were unable to use it. The drainboard (for doing dishes by hand) was filthy and stashed under the sink and there were nary a dishtowel in sight (we ended up using bathroom towels.) Plus, the sleeper sofa my husband and I were on was seriously from the 80s. Lumpy and uncomfortable. "Nice home near river and coast." Very nice home. Unfortunately the outdoor area was not well cared for. No propane in grill, outdoor furniture and table not cleaned, front seating area inundated with bird dropping. Additionally, the inside had not been sufficiently cleaned. Too bad considering every rental has an $80 cleaning fee. Otherwise, the size, layout, furniture and general vibe are very good. 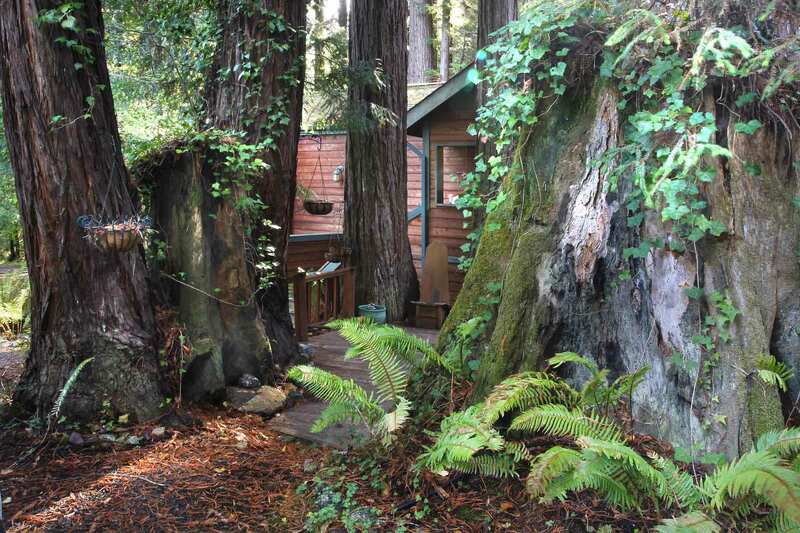 "Great private, quiet getaway in redwood forest." My husband and I enjoyed our stay in this beautiful home with vaulted ceiling, gas fireplace, private deck with pristine hot tub, and granite countertops. Service was fantastic as a few lights needed replacing. Least thing liked was tiny narrow road up hill to reach the home. Stayed for a weekend trip. Very nice house, nice layout (1 bedroom and 1 great room with living room, dining room, kitchen), great deck (full length of the great room) and hot tub. Used the bbq and it worked great. Plenty of space, large kitchen with everything you need. 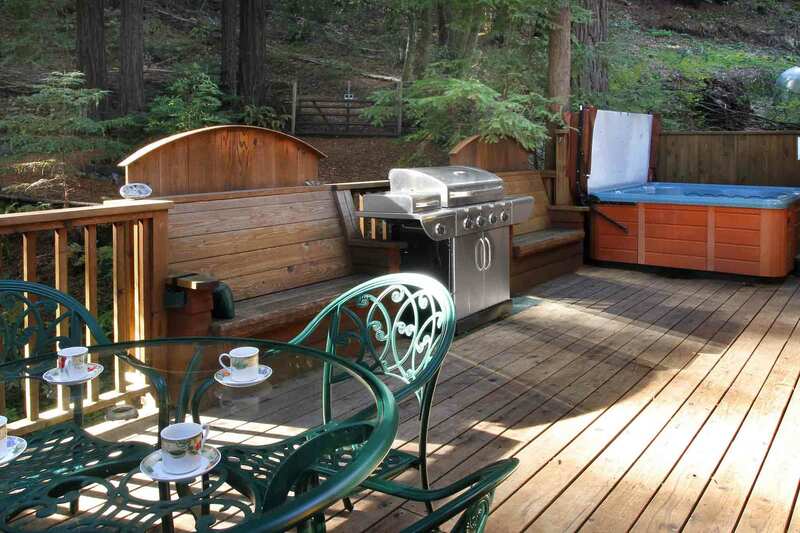 Great location in the redwoods, especially sitting in the hot tub in the morning. Very quiet and peaceful. Had one issue with some electrical outlets but nothing major and the property manager and owner were extremely quick to respond. Tv isn't the newest but it got the job done for a movie we watched. Short trip to the Russian river, Armstrong Redwoods state preserve, and also out to the coast and beaches. We did all of those in a weekend and never felt like we spent too much time in the car. For a quiet, relaxing getaway from civilization, this place was great. We had a great time at this rental. The house has an easy to use fireplace, hot tub, and grill. The internet was reliable and decently fast. We also did not find the lot across the street to be distracting. You only see it when walking out the front door, but I can see why others might - it kind of drags down the whole scene up on the hill. You can see the other house from the back deck, but we only saw their car drive by a couple times. We never heard or saw another person up there. There's lots to do within 15-20 minutes - small Sonoma towns, hiking, wine tasting, the beach. And even more if you want to drive into Sebastopol.We would highly recommend Euphoria!!! Had a lovely time at this rental. The house was very nicely designed and very well appointed. The fireplace, hottub, grill and wifi were all we needed. 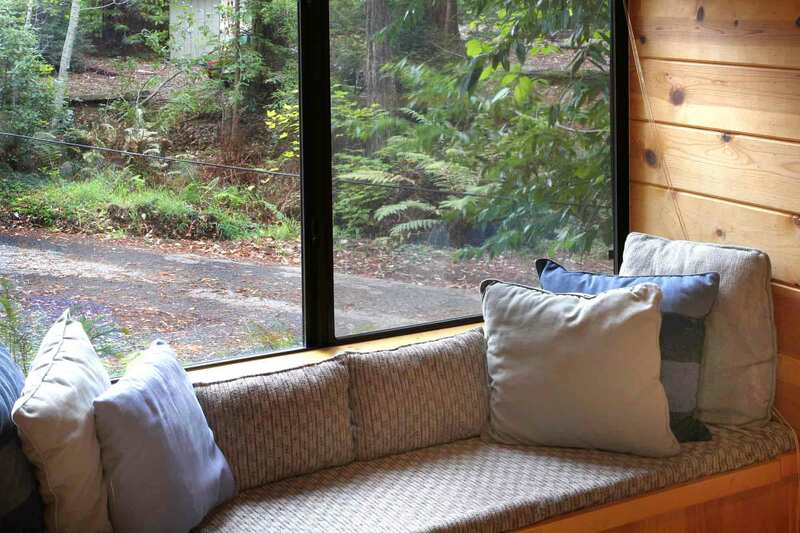 We wanted a quiet, restful getaway in the Russian River area and we found it here. We really enjoyed the fact that the back deck was fenced so our dog could hang out there. I did not find the house across the street to be distracting - I wonder if it was cleaned up since some of the other previous reviews. There is one other house that can be seen from the back deck, but I only saw them once and the house is far enough away that I still felt like we had our privacy. There's not much else to do in this area, which was the point (for us). 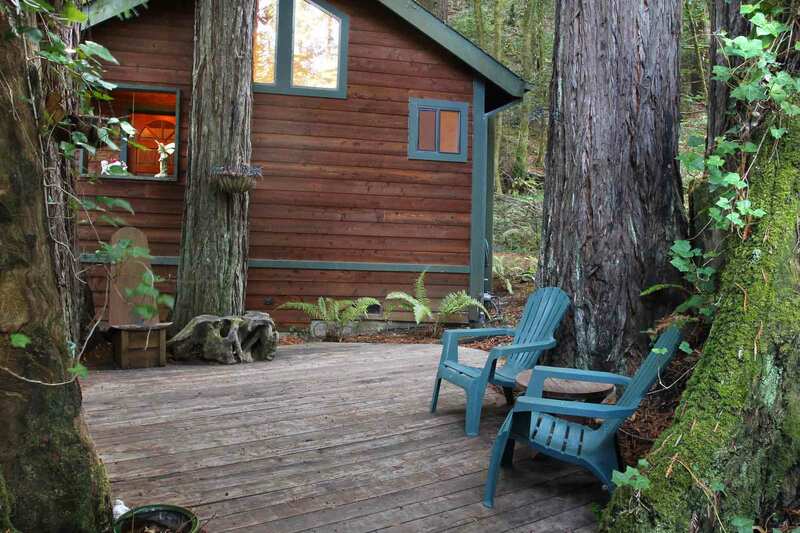 Guerneville is about a 15 min drive, but we knew that when renting in Cazadero. Still, we did not lack for options for groceries or things to do when we felt like exploring the area. I'd recommend to anyone who wants a relaxing getaway. When we first got to Euphoria, we were amazed how peaceful, quiet and secluded it was. It was more than we ever thought it would be. The only noise we heard were the squirrels and the birds. The rental itself was beautiful, clean and had everything we could have wanted. We didn't want to leave...it was like a different world...We don't get away often but it was a welcome getaway from all the hustle and bustle of daily life..We will definitely be back..Our dog loved it too...there was even a dog bowl in the rental..we brought our own but that was a nice touch..our dog felt welcomed too!!! The rental staff were great to work with. We chose Euphoria for a quiet, woodsy get away. That it was. The redwood forest is lovely. My daughter and i enjoyed morning walks and built up some muscle tone going back up the hill. The cabin is great but it is not a luxurious location; some visitors might find the the mix of poorly maintained and well maintained dwellings disconcerting. We didn't care. We had a great time cooking meals in the well stocked kitchen, grilling on the deck and enjoying the hot tub. The house is clean, contemporary, and comfortable. After busy days on the coast or at vineyards it was great to retreat to a secluded, woodsy cottage. We didn't care about the exposed vehicles and shed across from the front door. No one was there; there was no activity and no noise. It looks like a privacy fence might be rebuilt. 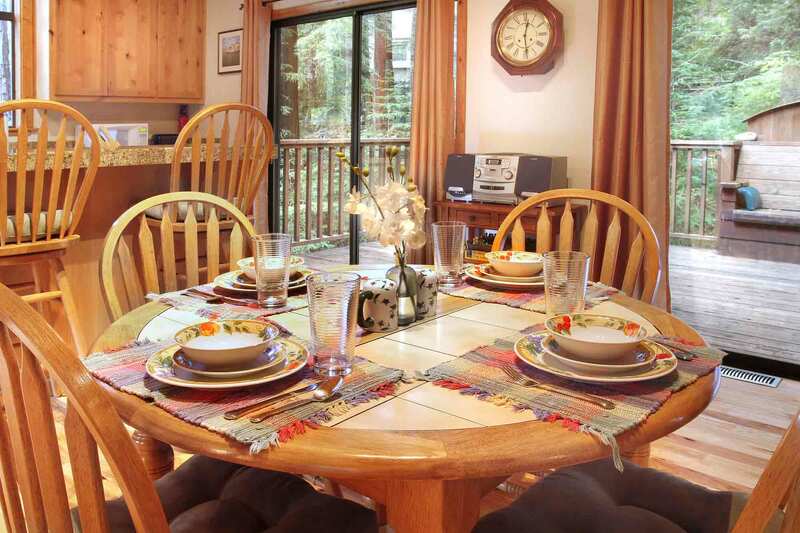 After hearing about our stay, another family member wants to contact Russian River Getaways! I wish there were 2-3 day summer rental options. We paid for 4 days and then a flight delay only allowed us to enjoy 2 but we figured the location and the amenities, even for only 2 days, equaled a less desireable hotel. For the cleaning fee, there should be more attention given to under beds, toothbrush holder, rim of hot tub. "A cute house in mediocre surroundings"
This small cabin was comfortable and cute. It's got a private deck with a hot tub, grill and table, a decent sized main room and kitchen, and a comfortable bed. What's not really shown in the photos of the place is what's around it. There's a bunch of construction equipment - plows and tractors and the like - across the street in an open muddy lot and that's about it. There's a house behind this one, too, up the hill from the back deck, but little else up this steep road. There aren't any trails around it or anything, and the road itself is nothing but no-trespassing marked driveways. A walk down the hill to the creek isn't too bad - about the same as walking down and back up 15 flights of stairs - but the creek (in July at least) is really low. Basically, we got up and left and didn't come back until we were done for the day.The amenities are nice. Washer/dryer inside, a nice kitchen, the hot tub was spacious and clean. This is our second trip to Euphoria and we had a great stay. The cabin is perfect for us and our westie. It's remote enough for peace and quiet, while also close enough to several places we like to visit. Euphoria has all the amenities you need for a comfortable stay. The redwoods that surround the property remind you that your in a serene and wonderful place.The only downside is the property across the street. It seems more delapidated cars are stored there than last time and it seems that some trees have been cut down. Just hope the owners can get that property owner to clean it up. Still, it's a great stay. Just shut the front blinds and all is well. Cabin was nice, a little out of the way than we thought. Great out of the way spot. I do agree the view from the front of the house onto garbage and old cars wasnt pleasant. I would see if something can be done about cleaning that up. very quite. Overall this was a wonderful weekend stay. We loved the cabin as it is very well kept up and the atmosphere was beautiful. We booked this place because the reviews had some great reviews and some not so perfect reviews. We did see the abandoned car type lot directly across the street and up the road, but this isn't the fault of this owner. There was some chainsawing on saturday but we were gone most of the day. We went to bodega bay beach and it was beautilful! A must see! We brought our yellow lab and our chihuahua that we just rescued. Our yellow lab had a great time swimming in the river which is about 3 miles away (monte rio beach) and our chihuahua almost got picked up by a owl outside the cabin at dusk 2 times!!! He really went for it and we screamed and he flew off..he was about 1 foot away from our dog..it was scary...that is what you see in these areas..this owl had a wing span of 5 feet!! The hot tub was delightful and relaxing. I understand what other reviewers were talking about in the bedroom and the lighting..even though you have 2 lamps and 2 bed lamps (one not working), it was just too dark but we slept very well. We loved the kitchen!! for improvements..only a suggestion..1) new towels, new couch hideabed and better lighting in bedroom. If you want a quiet, relaxing time close to the river, beach and downtown..this would be a good pick! A+ to the company who handles the reservations!!! was so easy!! Thank you. "If you want peace and quiet this is the place"
So we got a late start and got to the area at around 10pm on our first night of four. As our GPS said the final turn was coming up I saw a little drive and said "is that it?". "Nah", said my wife, "that can't be it" but as we kept going it became clear we had missed it.So I turned around and found the drive again and headed up this one lane unpaved road feeling like we were heading up some long private drive up a steep hill in the dark. Kinda scary/cool. Quick enough though we were at the place and with the combination lock were in without a problem.My kids (20 and 15) were expecting a little sparse crude cabin apparently. I guess since I kept calling it a "cabin".Great work by the guy who rebuilt the place. They even have a binder there where you can see work in progress pics of the him doing the work.So the kids were pretty surprised when they came in and were in the hot tub pretty quick.One night I was in the hot tub I thought it was so weirdly quiet. No critters running around. No birds talking...just silence.Did a little exploring in the morning and it looks like there's only one neighbor really. He was doing a little chainsawing of something during the day. Every thing else on this hill seems to be rarely used.If you're going to use the sleeper sofa be warned that it sags in the the middle a lot. Not a big problem if you sleep on your back like me. Otherwise it really sags in the middle. Glad these folks enjoyed the house. GPS does not work in this area; just use our directions to the house. The sleeper mattress will be replaced soon. Euphoria is a magnificent building, cozy with every amenity, placed in dense woods and enveloped by fresh moist oxygen newly emitted from the trees and ferns. It is amazing how dark it gets there at night, uncanny really: a true perceptual phenomena. I am usually up at dawn, but got much needed sleep because I didn't recognize the signals of sunrise. The price was less than most others, I guess because of location but it was good to be away from the full tourist situation along the river. Yet we were just minutes from the water, hot sun and fairly good restaurants. We cooked too and that turned out to be pretty easy because the kitchen is well equipped for straight ahead meals. It was good. I would go there again. Even the property across the road seemed quaint in a rugged, pull yourself up by your boot straps kind of way. By the way T Mobile doesn't work there (god bless them) but Verizon was just fine. I got a little work done too. Internet access kicked right in. The cabin was great. It is comfortable and clean. The check-in is wonderful. Both tanks to the grill were empty, so we couldn't grill. Also, it should be noted in the house instructions that the oven takes over an hour to preheat, so plan you cooking times appropriateley! It is a very relaxing home for the most part. "Our experience at Euphoria was wonderful!" We needed a get away, some where beautiful, secluded and peacefull and that is exactly what our experience at Euphoria was. The only thing I would changed about our trip and stay was the length, next time we will stay for a week! We booked at the last minute, and it was a great vacation! The whole process with RR Getaways was simple, and the property was exactly as described. Euphoria is a really nice, modern, well maintained house. The woods are beautiful - we saw deer and a fox from the deck. 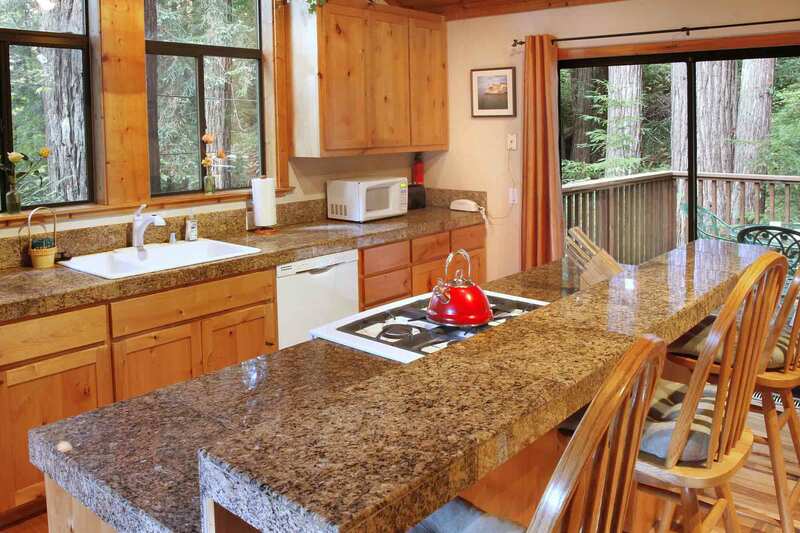 Easy access to Guerneville (about 10 - 15 minutes), Monte Rio (with it's dog friendly beach), and Duncan's Mills. I'd definitely book this place again - good value! "Peaceful creek wonderland for adults, kids and dogs alike!" Had a fantastic weekend getaway with the family. Reservations couldn't have been any easier and both the owner and company (Russian River Getaways) were very helpful and accommodating when we had trouble locating the private beach access. The cabin is beautiful - both in setting and amenities. My husband and kids loved relaxing in the hot tub and looking up at the towering redwoods. The boys and dogs (unleashed) spent hours wandering in austen Creek catching crayfish splashing about. Great fresh baked breakfast goodies and coffee available 10 minutes away at either Gold Coast Bakery or Robert's Bakery. Overall a great destination for families with kids and dogs! We'll be back! The cabin was perfect in every way! The setting was absolutely beautiful, and we can't wait to come back again for another stay soon. "Beautiful interior cabin--exterior left much to be desired"
The interior of the cabin was charming, clean, and newly built or renovated. The kitchen was large and great for cooking, the grill worked great, the bed was comfortable, the layout was open, and the cabin itself was comfortable with the exception of the lack of lighting in the bedroom. The cabin was a bit dark and did not have a view. There are 3 or 4 neighbors very close, so it was more like being in a subdivision than in a remote mountain location. One of the neighbors was doing construction during our stay and it was quite loud. The lot across the street houses junk appliances, abandoned cars, several scary-looking tool sheds, and many "No Trespassing" signs. It was a little scary and if I owned this cabin, I would definitely complain about this as an eyesore and even a possible safety hazard since most counties have regulations about junk cars and appliances being stored on residential lots. The neighbors behind and next to the cabin also had several visible "No Trespassing" signs, so the area was not welcoming at all. We did not use the hot tub on the back deck because there was no privacy, nor did we open the blinds much. Another odd thing about this cabin was that the voicemail was full of messages from bill collectors. I had left the number for our pet sitter in case of an emergency, so I had to weed through the bill collector messages to see if the sitter had called. The area of the Russian River was amazing: great hiking, swimming, canoeing, and wine tours, but we will not be staying in this cabin again. We think that for the money, we could have gotten a more secluded location without construction noise and scary junkyard lots across the street. I do recommend the Russian River as a vacation spot, and maybe this company has better cabins than the one we stayed in. Call and ask questions to make sure the cabin has what is important to you. "Euphoria" induces just that! A beautiful, spacious, very comfortably appointed home with a fantastic deck, great kitchen and wonderful ambiance. We spent a really lovely weekend there and would come back in a heartbeat! 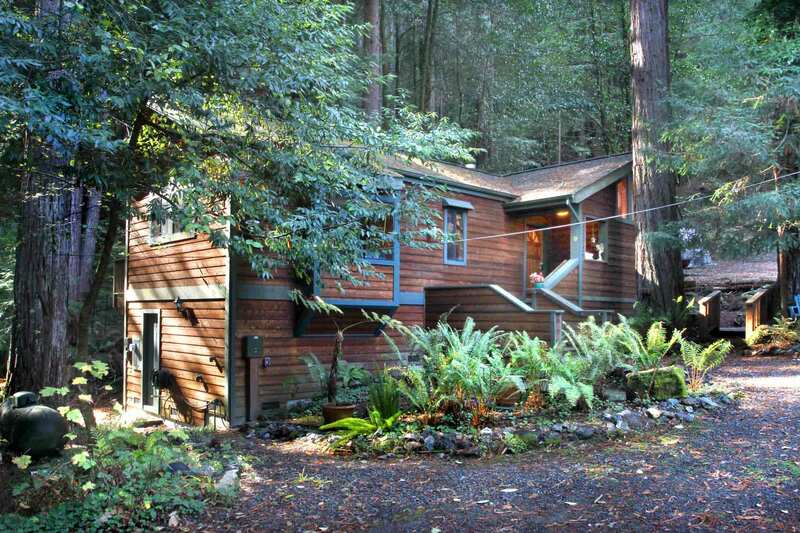 The cabin was wonderful, close to Guerneville. Had all the ammenities and was very cozy and private. Our dogs love it and so did we. We suggest more lighting in the bedroom and replacing the queen sofa bed. This one was very uncomfortable. Other than that we would definetely return. "Blissfull and Relaxing, Can't wait to return!" We enjoyed our stay at Euphoria and the keyless access allowed us to head striaght to the property. Only wish this property were a bit more secluded, other home above looks down on back patio. I had a wonderful time renting out this cabin. It was very clean and comfortable. It had everything you needed to enjoy your stay. I went with my boyfriend and we just relaxed, took walks, cooked (especially bar-b-q), watched movies, and enjoyed the hot tub which was super.I would defiantly rent out this spot/location again. Although there was a couple of houses around, it was private and it felt like nobody was around. Actually we didn't even see the neighbors.I rated the service as a 5 although we didn't have any service requirements, which was a good thing.. Check-in/out was great; keyless entry. No need go to go to the rental office. Lights were on when we arrived, and the hot tub was already heated. My pet also enjoyed her stay. She was comfortable. I also like the fact that the deck was enclosed, so I didn't have to worry about her safety when she was outside in the back.The only thing is arriving at night. The street sign is very small and very hard to see. It took us a couple of trips up and down the road before we saw it.No cell phone service at all. That was great. We were detached from everyday life.Me and my Honey loved it!!! I would also recommend it during the winter. It's so beautiful. "Clean & cozy, but we'd prefer to try another cabin next time"
We loved the "Winter Special" of 3 nights for the price of 2, however with that little extra discount, we both agreed that we would of rather spent an extra $20 a night to stay in a cabin that was a little bit more comfortable and centrally located. We were bummed to pull up to the cabin and see that directly across from it was a run-down abandoned house with a junk yard in front of it. 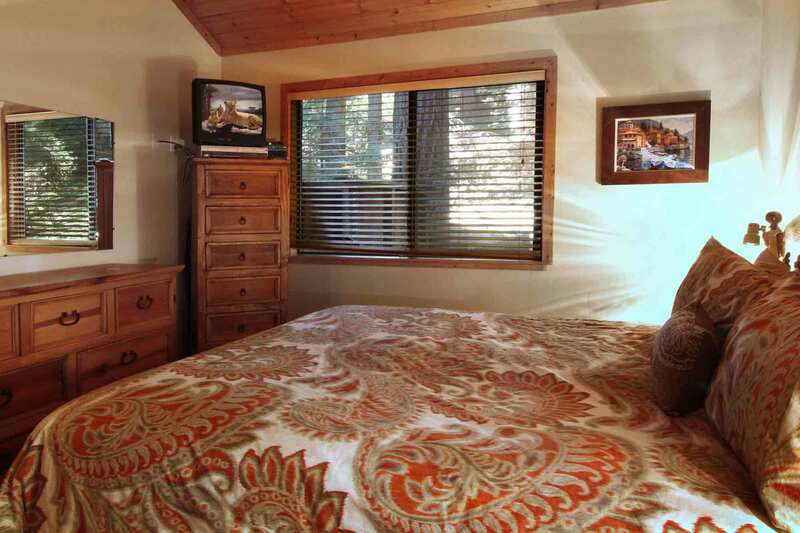 The cabin itself was very clean, had beautiful hardwood floors, comfortable bed, a gorgeous deck (loved the hot tub underneath the redwood trees) and a very user friendly electric fireplace. However, the couch and recliner chair have definitely been through some wear and weren't very comfortable.We came to Cazadero to have a relaxing weekend out in the woods, visit some wineries, eat at some local restaurants, and have some down-time at our cabin, which we did get - however, next time we will probably stay in Guerneville, which still has that "out in the woods" feeling, but it's way more centrally located to the wineries, beaches, restaurants, and grocery stores. I would recommend Euphoria to families with kids, or couples that are not planning on doing a lot of activities that require extensive driving. We've stayed with RR Getaways once before and the folks who helped us book the cabins were so friendly and accommodating. The keyless entry was great, and the check-in/out process was effortless. We will definitely book a cabin with RRG again, but probably not Euphoria. Overall, the propery and my stay was very good. However, there are a couple of areas that could be improved. The television in the living room is very old and in poor condition. The sound quality is not good. Also, the overall condition of the living room sofa, recliner and mattress is also very poor, providing little support. Other than those couple of items everything else was excellent including the service, ease of making the reservation and arrival at the property. The only thing that was missing was a wine opener, every other kitchen tool that could have been needed was present but someone might have taken the wine opener as I could not find one. Other than that the place was awesome and I will book it again in the future!! We had a very enjoyable stay at the Euphoria house. Our stay and the entire RR Getaways process were simple and stress-free. The location is pretty far off the beaten path, which we enjoyed. The house is small--perfect for two visitors. We especially loved the big kitchen and the back deck for relaxing. I would say that the only (slight) drawback is probably the proximity of the neighbors. The house itself is not very secluded. However, this didn't take away from our experience. Overall, we loved the house and would certainly recommend it. "Peaceful sanctuary in the redwoods"
This is a charming cabin in a peaceful setting that seems remote yet is just minutes (driving) from town. The cozy home has every amenity, quality kitchen ware and plenty of fresh towels! 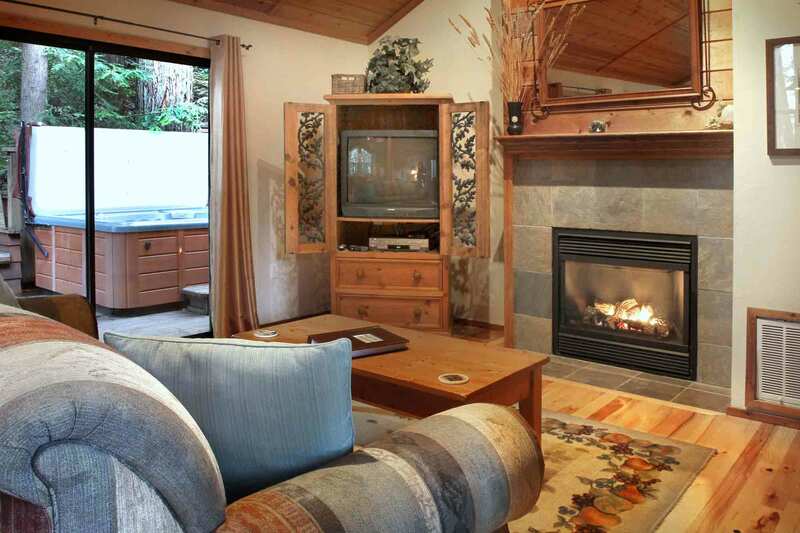 We liked the cable TV, wireless Internet, warming fireplace and well-maintained hot tub. The owners have decorated with quality throughout. I feel that it's easy to have a great experience when all goes well. What really matters is what happens when you have something come up. That's what impressed me most about Euphoria. I called about a small issue, and both the agency and the owner responded to me within minutes to resolve it right over the phone. I felt bad to bother them about a small issue, but they invited me to call again for anything! We had no other issues and enjoyed our stay very much. We would definitely stay here again and recommend it to others. In five to ten minutes, you can be at the coast for a scenic drive, dinner or lunch. Just minutes the other way and you have towns with shopping and wineries. All over the area you will find natural settings and scenic drives. Then come back to Euphoria and grill something delicious on the patio barbecue! "nice break from the city"
nice weekend retreat. quiet, relaxing, and has everything you need for a short trip.Bedroom had a musky moldy smell. Could have been the linens? Not sure. 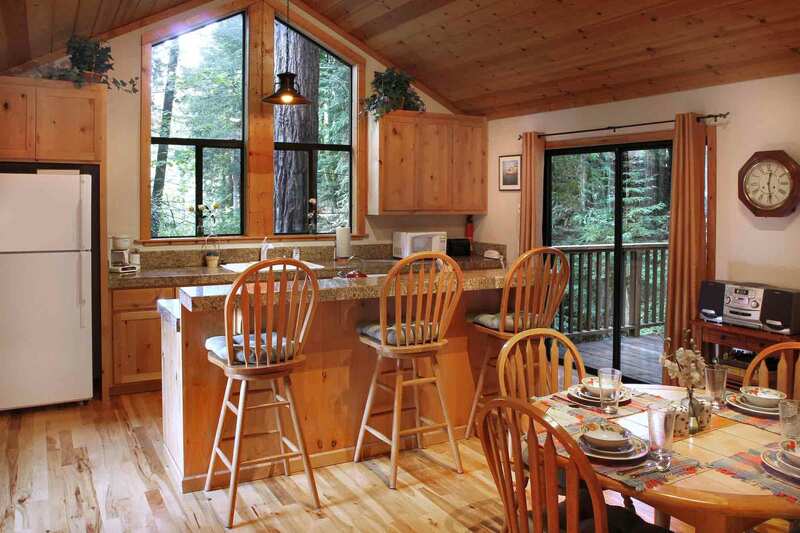 Our stay was a mixed bag, but Russian River Getaways corrected what they could and compensated us for the few issues we experienced.We arrived to a cabin that had not been cleaned from the previous visitors. We called the Russian River office, and they sent an experienced cleaning caretaker (Thank you, REBA!) to correct the problem. The cabin owner also came by to replace burned out light bulbs and repair several clocks that had stopped.Because of the relatively strict check-in/check-out times, we basically lost the first day while waiting for the cabin condition to be corrected. Again, the Russian River office gave us an additional night's stay to be used during a future visit. We appreciate your efforts to resolve these issues.The second day gave us a chance to really enjoy the cabin and the surrounding area. 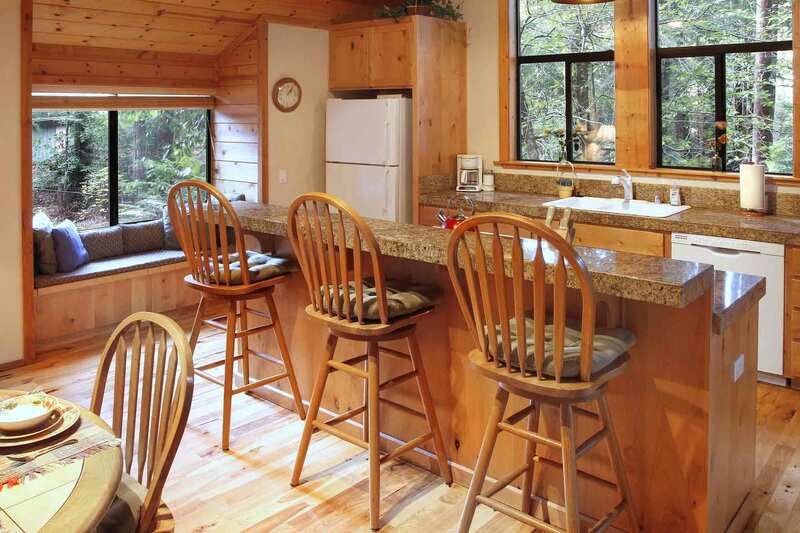 The interior of the cabin is cozy and comfortable, the wireless Internet access is very fast, and the backyard patio (barbeque grill and hot tub) is great!We walked down the main road where there is an access to a quiet stream, which our dog loved. It gave us the privacy that we were looking for.Thank you for making things right for us. Loved the cabin. It feels brand new. I appreciated how well thought out the furnishings are. Lots of beautiful dishes, all the cooking utencils you'd need, wifi, reading lamps on each side of the King sized bed. The hot tub on the deck was spacious and comfortable. By the way, Russian River area in the winter is nearly tourist free and a great place for walks in the rain. My husband, dogs, and I had a great time experiencing all this cabin had to offer! Great location...very peaceful and relaxing. All the comforts of home with fresh towels, an extremely comfortable bed and a hot tub on the back deck! I hated leaving this place....it was the best!